Wow!! 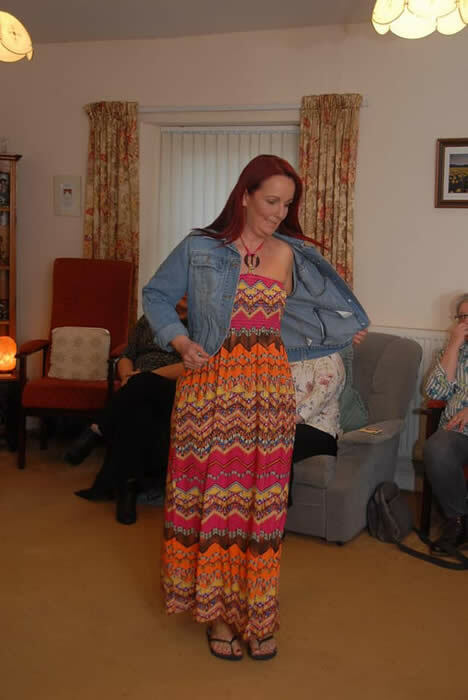 This was both a Fundraising and Social evening and a very big thank you to everyone who attended or was involved in an excellent evening at the Pembrokeshire Cancer Support Charity Shop Fashion Show. A huge thanks to all the wonderful and hard working Ladies who volunteer in the Shop who worked so well to ensure it was a very successful evening. Thanks to Derryn for keeping order and Lisa for the photography! The event could not have happened without the hard work of everyone and a fantastic £350 was raised on the night for the Charity - Thank You!! 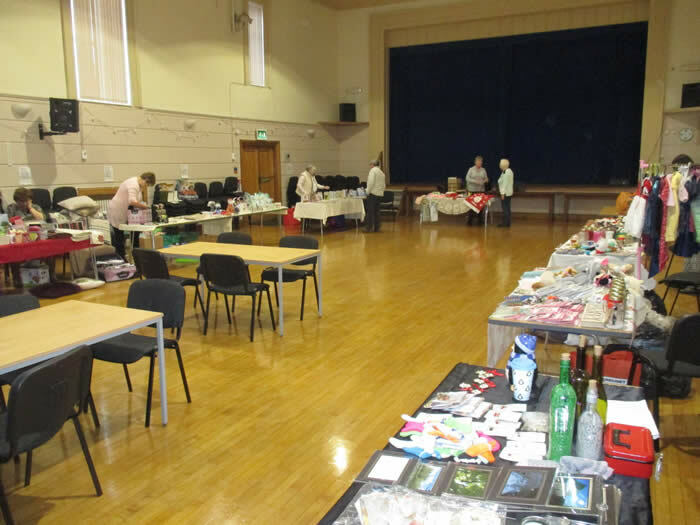 Thank You from us at Pembrokeshire Cancer Support to all who attended our Coffee Morning at the Pater Hall, Pembroke Dock on Friday - Your support was very much appreciated!! A Very Big Shout Out and Thank You to my friend and colleague Derryn (Support Worker) who worked so hard to organise the whole event. A fantastic £219.71 was raised which will benefit all who use our Support Centre and Outreach Services. A Big Thank You is due to the members of Neyland Masonic Lodge 990 for a fantastic donation of £305. Lyn (Charity Coordinator) and Steve Elliott (Charity Trustee) went along to meet the Lodge Master, Mr Phillip Hancock to be presented with the cheque. We are very grateful for the support of Neyland Lodge and the donation will benefit people who use our Support Centre and Outreach Services. A Massive Thank You is due today to the fantastic Preseli Babas for their Amazing donation of £250 to Pembrokeshire Cancer Support. They have been raising funds for our Charity during their busy season. It was great to meet one of the players, Laurence, who came to the Support Centre to present the cheque to Derryn (Support Worker). 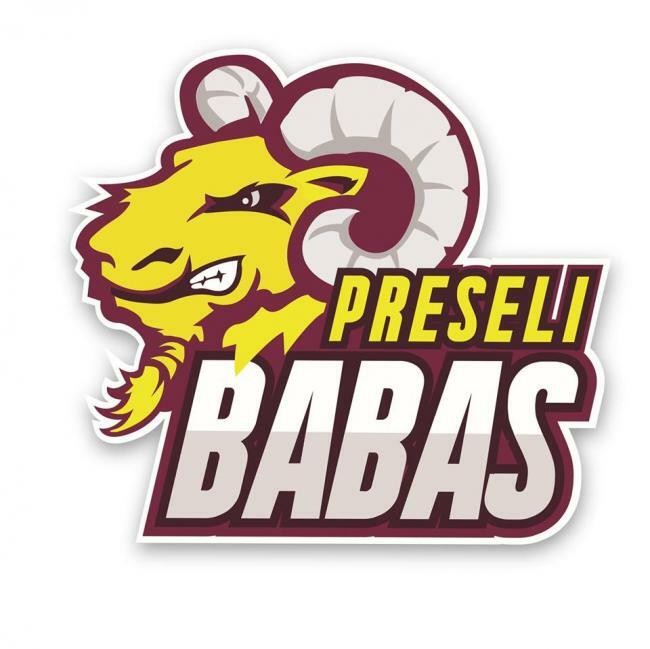 We very much appreciate the Help and Support of all involved with the Preseli Babas as do all the people who use our Support Centre and Outreach Services. 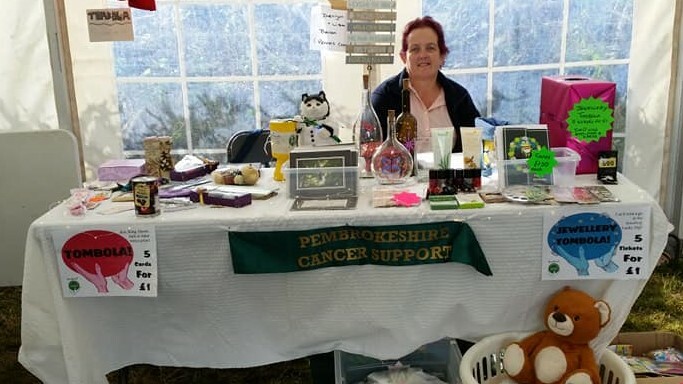 Derryn (Support Worker), Lisa and "Dave Cat" headed off to the Clynderwen Show on Saturday 25th August with a stand for Pembrokeshire Cancer Support. They had a great time and all had a very enjoyable day. Also, an amazing £78.50 was raised for the Charity. 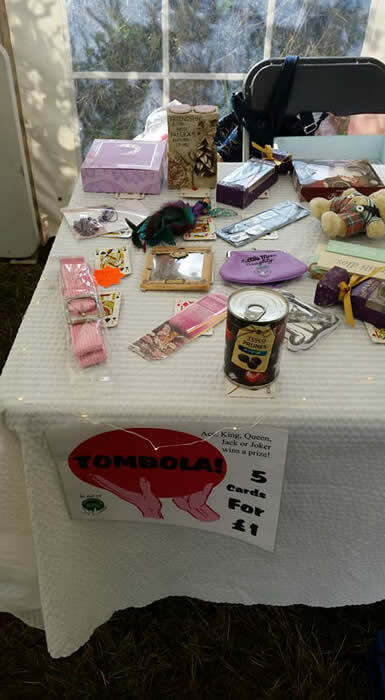 Thanks to all who visited the stall and made a donation. 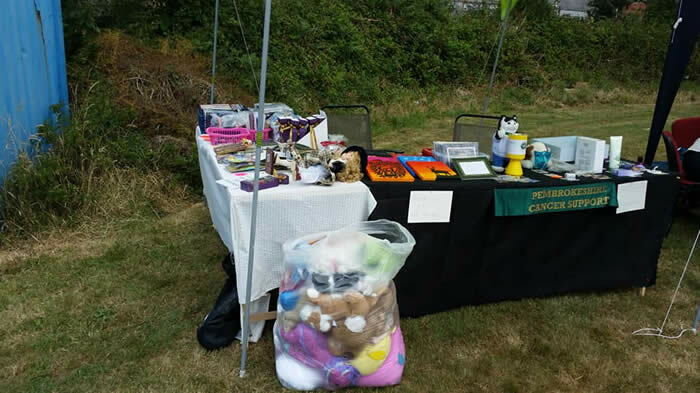 Derryn, Lisa and Dave Cat set out on Saturday 14th July to do another stall for Pembrokeshire Cancer Support at the Clynderwen Fun Day. A good day was had and an excellent £40 was raised as well as spreading the word!! 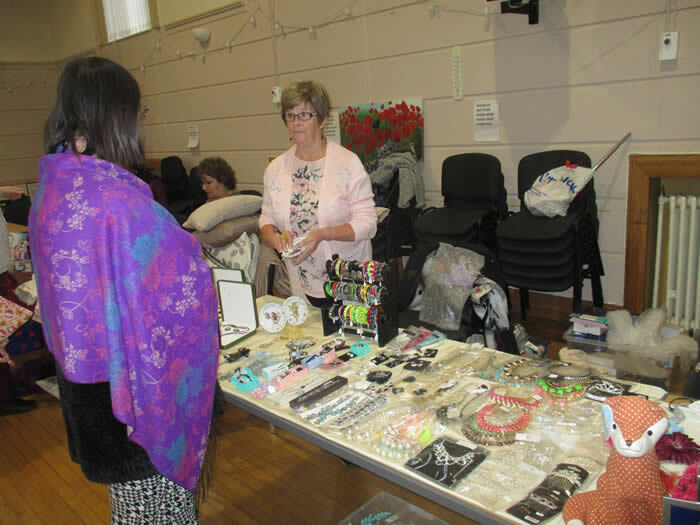 The stall holders were a bit camera shy on the day!! Lyn (Charity Coordinator) went along, on behalf of Pembrokeshire Cancer Support, to the Eucharist Service today at the beautiful St Mary's Church in Tenby. The Church looked amazing on such a beautiful day and there were lots of flowers for the Remembrance Service coming soon. Lyn was presented with a cheque for £500 by Assistant Curate & Focal Minister Reverend John Morgan on behalf of the Church Charity Committee who help local charities and causes every year. We thank all involved in the decision to support our Charity. 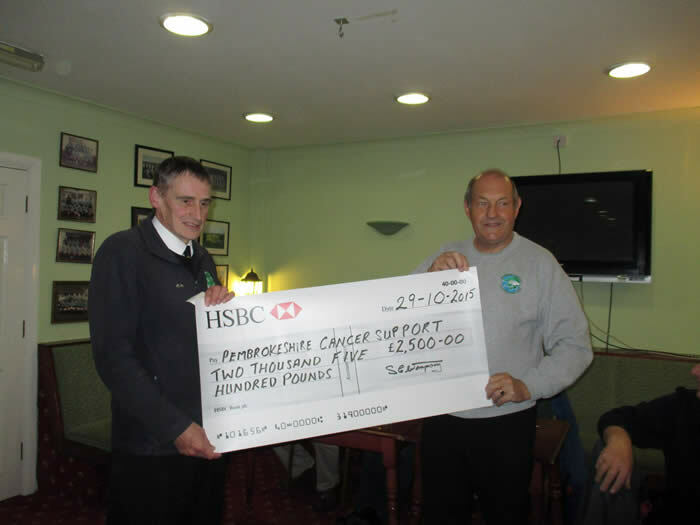 Pembrokeshire Cancer Support has to say a very Big Thank You again to Mr Mike Bradney and his colleagues from the Castlemartin 1748 Masonic Lodge. Lyn (Charity Coordinator) and Steve Elliott (Charity Trustee) went along to visit the Masonic Lodge in Pembroke Dock. A really excellent group of gentlemen who gave a donation of £500 on behalf of the lodge. We thank all members of the Lodge and your support is very much appreciated by us and all who use the Charity. It was lovely today to welcome Karolyn and Louise (Valero, IT Team) to the Support Centre. 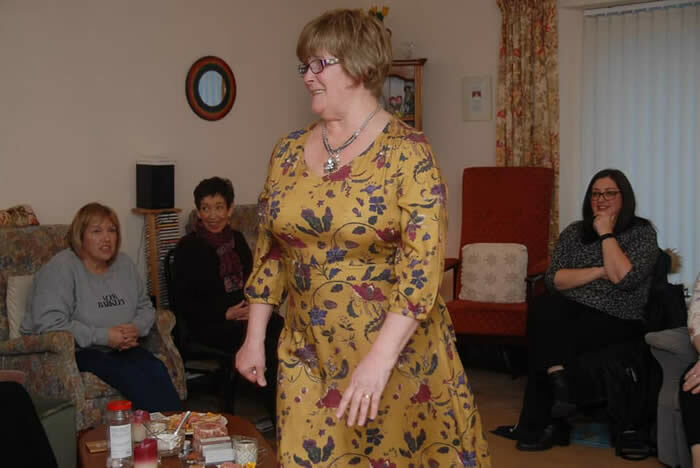 Karolyn, along with her colleagues last October, held a Halloween cake and games hour to raise funds. Derryn is seen being presented with a cheque for £110 which has been match funded by the Valero Pembroke Refinery . We thank the IT Team and Valero for their help and support which is very much appreciated!! Pembrokeshire Cancer Support had a lovely surprise on Monday this week when we had a visit from Susan and John Shaw of the "Happy Band of Travellers". 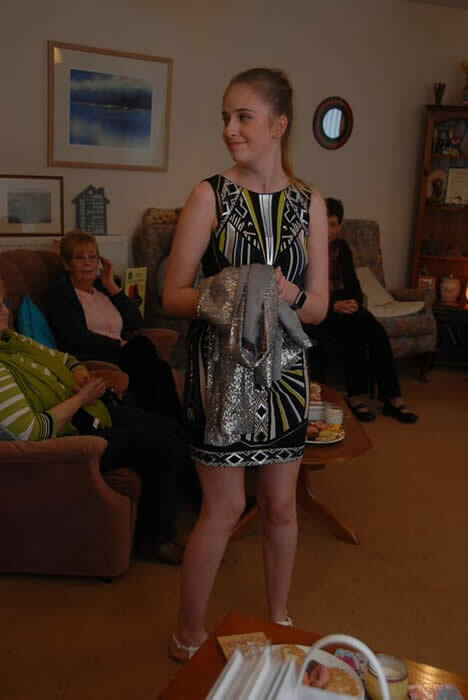 They organised a recent trip to Alvaston Hall where they did some fundraising activities. They presented us with a cheque for an amazing £250. 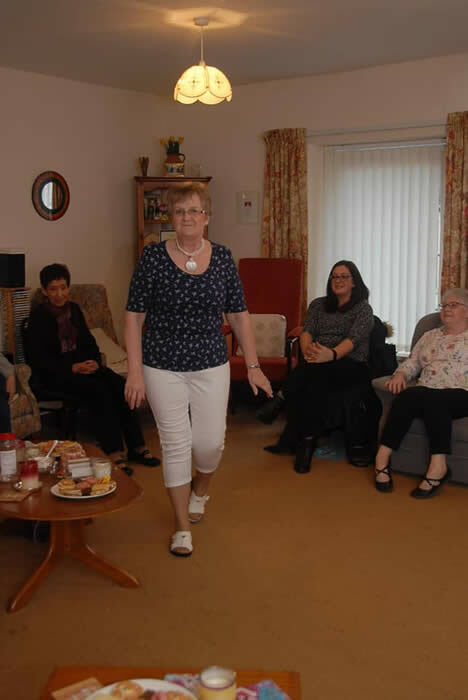 The photo shows Sue with some of our Monday Card Group, Sheila, Gillian and Gwyneth. We thank the Happy Band for their support!! 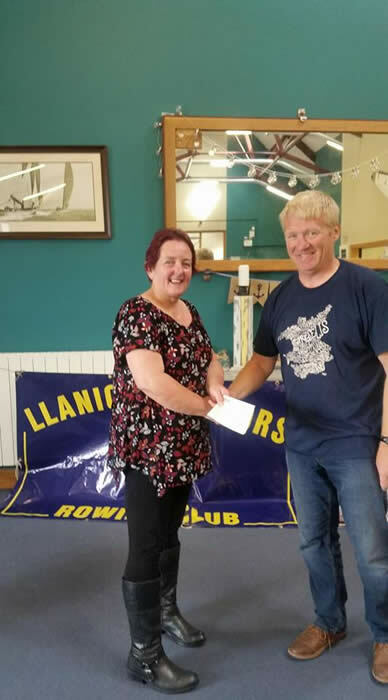 A Huge Thank You is due today to Richard Jelley and all the Members and Supporters of the Llanion Warriors Rowing Club for an amazing donation of £2,000 to our Charity. Derryn (Support Worker) is seen being presented with the cheque by Richard on Sunday 11th June. Thank you to all the Llanion Warriors for this donation which will help all the people who use our Support Centre and Outreach Services. Pembrokeshire Cancer Support has to say a very Big Thank You today to Mr Mike Bradney and his colleagues from the Castlemartin Masonic Lodge. They came along today to visit the Support Centre and have a look around today. A fantastic group of gentlemen who have given a donation of £500 on behalf of the lodge. Your support is very much appreciated by all who use the Charity. 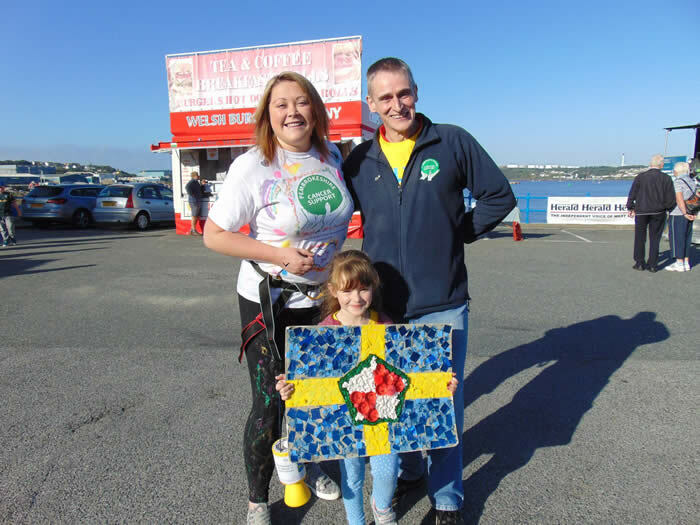 Pembrokeshire Cancer Support would like to say a Very Big Thank You to all at LHP Chartered Accountants for their fantastic donation of £645 following the sponsored walk along the Brunel Trail. Lyn went along on Thursday 24th November to be presented with the cheque. Thank you so much from all of us at the Charity for your amazing support!! 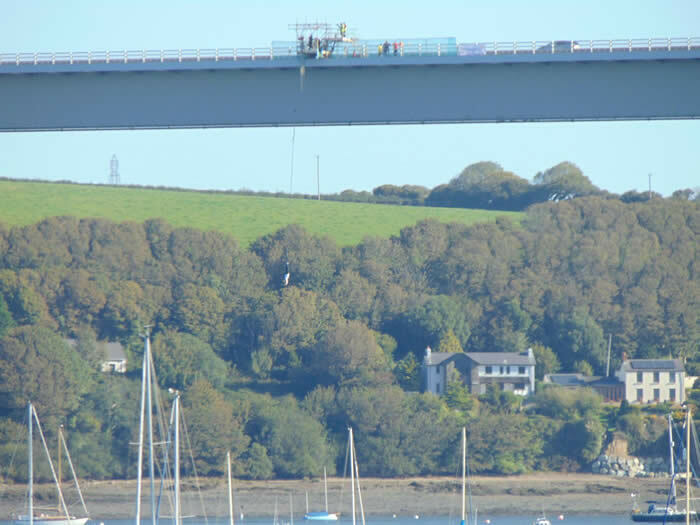 Thanks to Rob Nichol, who works in the IT Dept for the Port of Milford Haven, for supporting our Charity by "Bungee-ing off the Bridge." We very much appreciate your Support, Kindness and Bravery!! Rob raised an amazing £462.50 and is seen handing the cheque to Barbara (Support Worker). 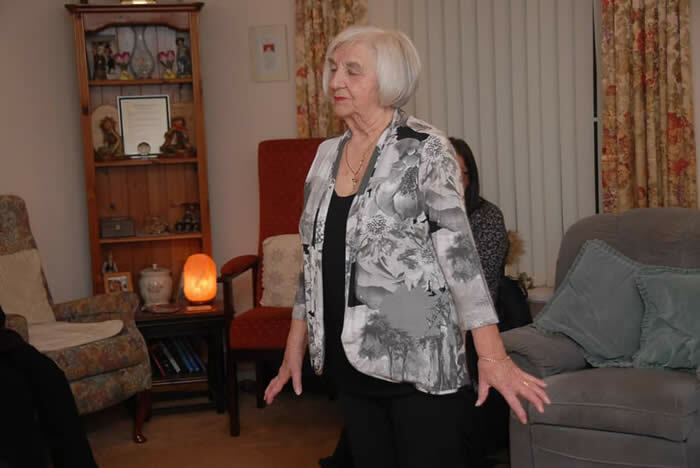 Cancer sufferers at Pembrokeshire Cancer Support are to receive reflexology sessions thanks to a funding boost from the Port of Milford Haven. The charity was selected by staff at the Port to be its official Charitable Cause of the Year throughout 2016 and has so far benefitted from fundraising activities, donations and a freshly painted charity shop. Reflexology is a specific pressure technique that works on precise reflex points on the feet and, as a holistic healing therapy, can help relax, balance and improve nerve and blood supply to the area of the body that needs it. Some people report that they can sleep better and feel less stressed after the sessions. As a Trust Port, the Port of Milford Haven helps a wide range of charities and community organisations which seek to improve the economic and social wellbeing of those living in the Port region. For more information about Pembrokeshire Cancer Support visit or call 01646 683078. 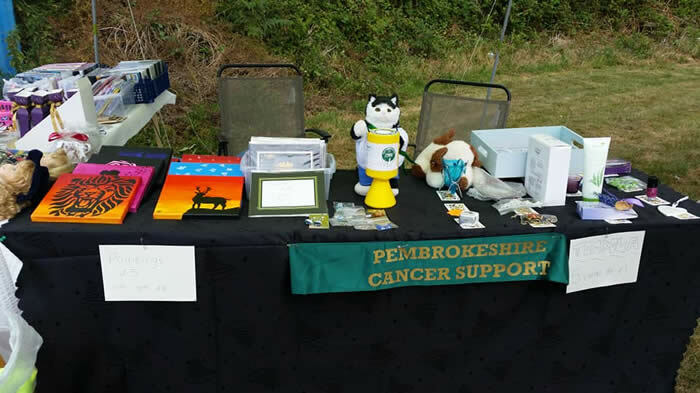 A big Thank You to Pembroke Power Station for allowing us to have a stall at the Pembrokeshire County Show. The Charity led by Barbara Miller (Senior Support Worker) attended on all three days and had a great time. We met lots of lovely people and raised a fantastic £205.75. 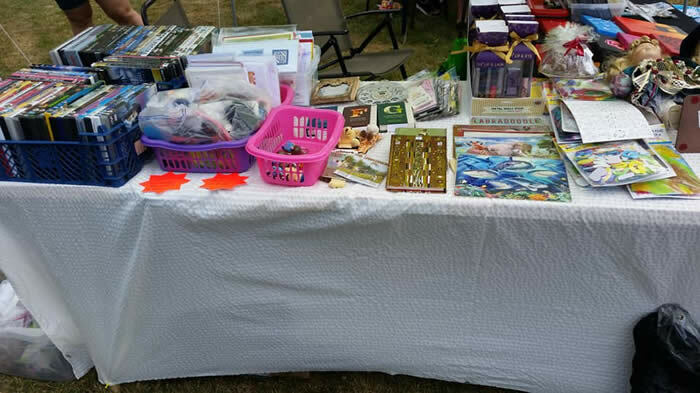 Thank you to all who volunteered to help on the stall, Hetta, Chris, Jeanette, Catherine, Terri and Sharon. A Very Big Thank You is due today to the St Mary's Church Charity Fund. Lyn attended the Eucharist Service at St Mary's Church, Tenby on Wednesday 25th May during which the Charity were presented with a cheque for £500. The cheque was presented by Reverend Sylvia Temple on behalf of the St Mary's Church Charity Fund. We are very grateful to receive this wonderful donation which will help to fund the Support Centre and our Outreach Services. 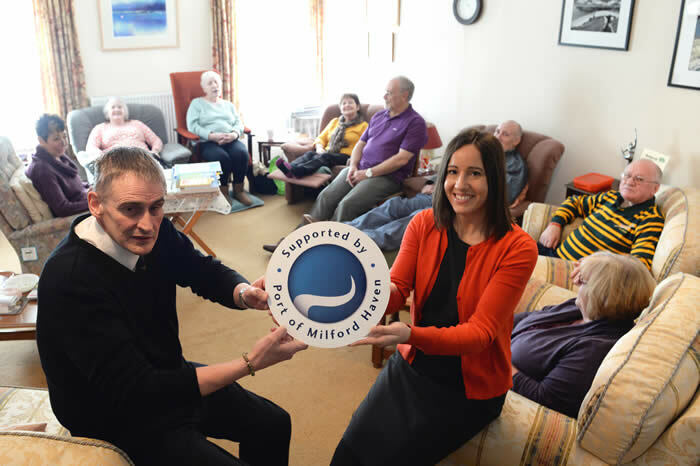 Cancer sufferers and their families are set to benefit from twelve months of relaxation sessions following a donation from the Port of Milford Haven. Pembrokeshire Cancer Support was voted the Port’s Charitable Cause of the Year by its staff at the start of 2016. 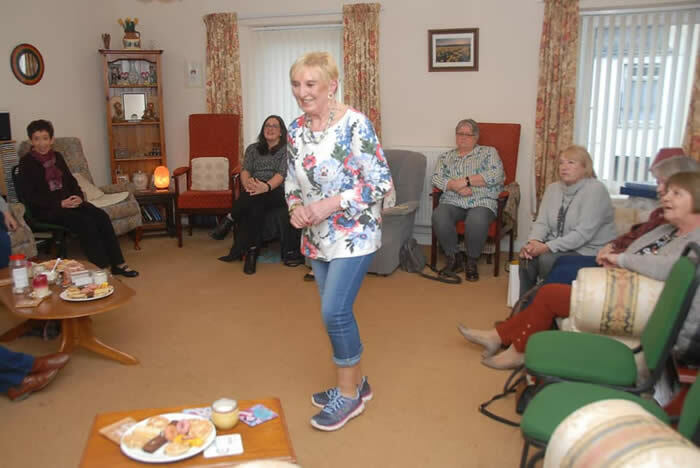 The classes take place twice a week at the charity’s Support Centre in Pembroke Dock and give patients and their carers time away from their daily worries and help alleviate stress. The centre offers a secure environment for group meetings and one-to-one contact where information and support can be given. 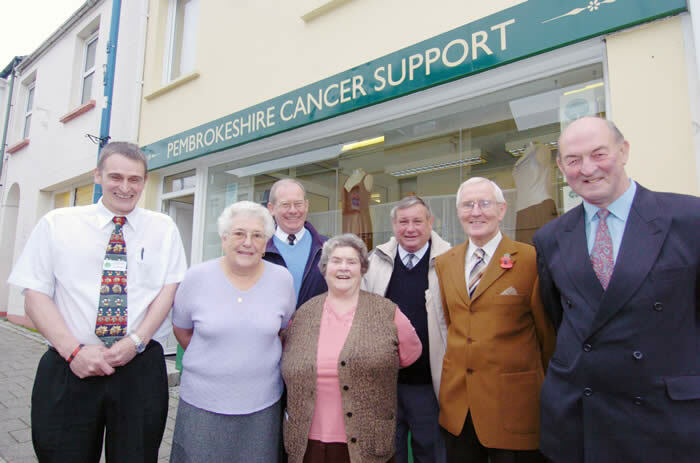 In addition to their base in Pembroke Dock, Pembrokeshire Cancer Support provides outreach services in Crymych, Fishguard, Narberth, Solva, Tenby and Withybush Hospital in Haverfordwest. As a Trust Port, the Port of Milford Haven helps a wide spectrum of charities and organisations within the local community which seek to improve the economic and social lives and opportunities of those living in the Port region. For more information about Pembrokeshire Cancer Support . An application was made to the Morrisons Foundation in November last year for help with the costs of Reflexology at the Support Centre. Recently we were notified that we had been successful and today we received a cheque for £2,500. We are very grateful for the support of the Morrisons Foundation to help with the cost of an essential service for cancer sufferers and carers who use our Support Centre. Thank You !!! Lyn went along on Monday, 7th December to the A.G.M. of the Ladies Section of Haverfordwest Golf Club. 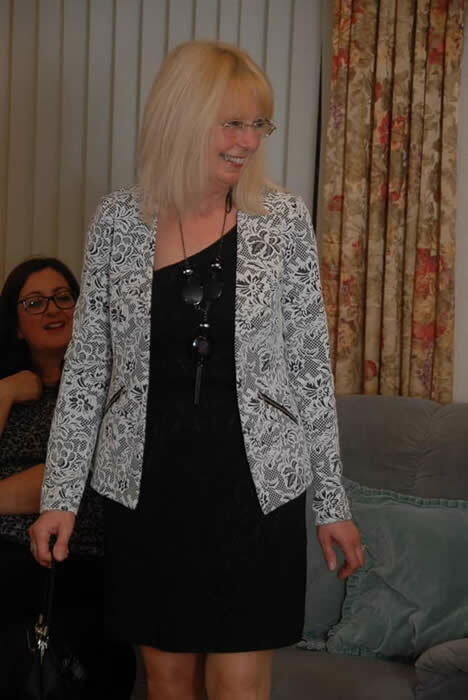 Mrs Andrea Duddin has been Ladies Captain for the past 12 months and had chosen us as her nominated Charity. Throughout the year events have been held and last night Lyn was presented with a cheque for £1,161.00. It was lovely to meet the Ladies and we are so grateful for their support. This donation will make a big difference to our services and help Pembrokeshire people. Thank You very much. 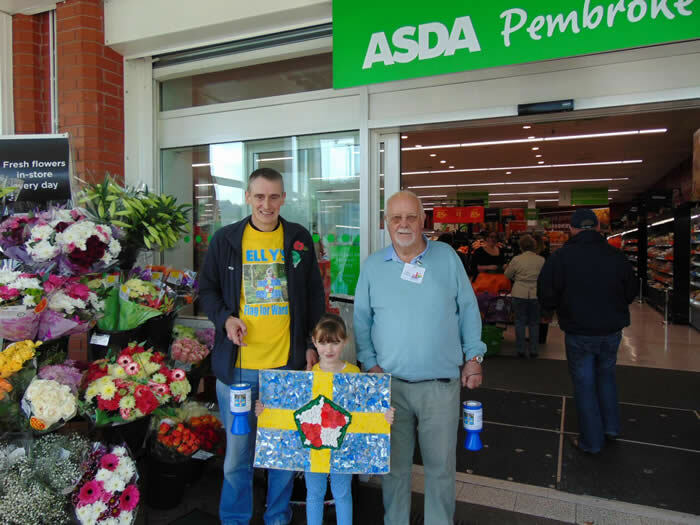 Elly's Ward 10 Flag would like to say a very Big Thank You to Pembrokeshire Cancer Support Trustee, John Arman, for coming along to help collect at Elly's Asda Pembroke Dock Collection on Saturday 31st October. We thank John for his support or as he would say, "it's for a good cause". John feels that we should all work together to improve Cancer Services in the County. John is a great guy who is always willing to help - Thank You John. Wow!! 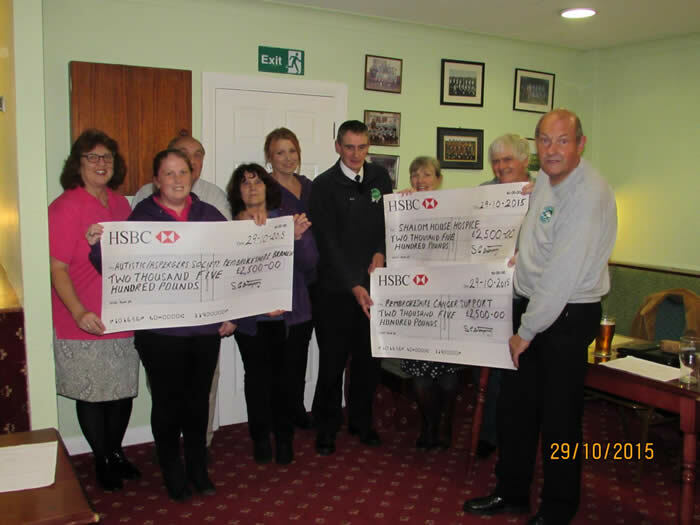 What a fantastic evening for our Charity at the Cheque Presentation Evening held by the Pembrokeshire Classic Car Club at the Haverfordwest Cricket Club on the 29th October. Lyn was presented with a cheque for £2,500 following the Club's very successful event in the Summer at Scolton Manor. Also given cheques were the National Autistic Society Pembrokeshire Branch and Shalom House Palliative Care Centre. It was a lovely evening with some wonderful people and a great buffet!!! This donation will make a big difference to our services and help Pembrokeshire people. Thank You, Lyn. WELL DONE STACIE !!! We have our own Charity Superhero in Stacie who did the Bungee off the Bridge on Saturday 26th September. Stacie also raised funds for Elly's Ward 10 Flag. What an amazing lady she is. 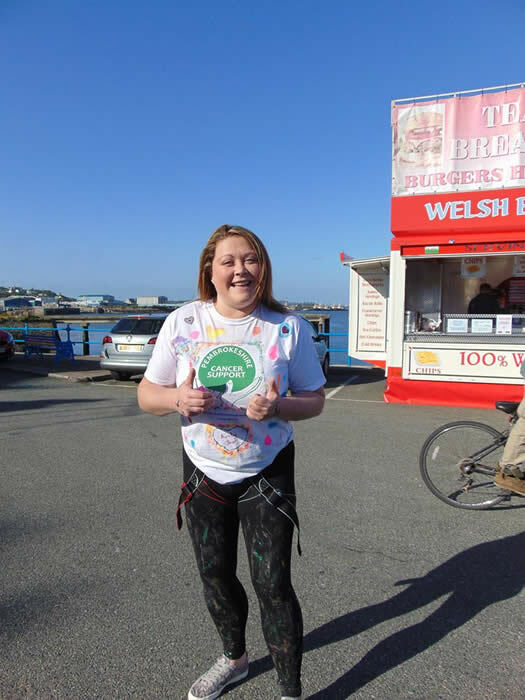 We know that Stacie has raised an amazing £428 for Pembrokeshire Cancer Support which is fantastic. Thank You Stacie from all at Pembrokeshire Cancer Support !! Your Aunty Jean would be very very Proud of you!! Lyn went along to Stepaside C.P. School this morning to meet a very nice young lady called Chloe Flynn. Chloe came up with a fundraising idea and wanted to give the money raised to a local Charity. Chloe's Aunty, Jane Thomas, has used the Charities Support Centre and received visits at home during her treatment. Chloe decided that this was the Charity she wanted to help and organised, with the help of Mr Merriman (Year 6 Teacher) a School Football Tournament. This took place on Thursday 16th in a mixture of weather from sun to heavy rain but everyone enjoyed it. The parents paid to watch and other fundraising was done on the day. When the money was counted a wonderful total of £478.00 was raised. Lyn attended the school assembly to receive the presentation from Chloe. Thank you to Chloe and all at Stepaside School for this donation which will help Cancer Sufferers and Carers throughout Pembrokeshire. 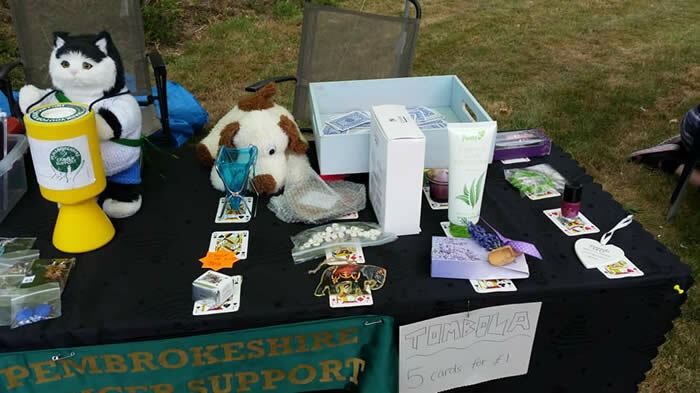 Derryn and Lisa attended the Clunderwen Carnival with a stall and tombola to raise funds for the Charity. 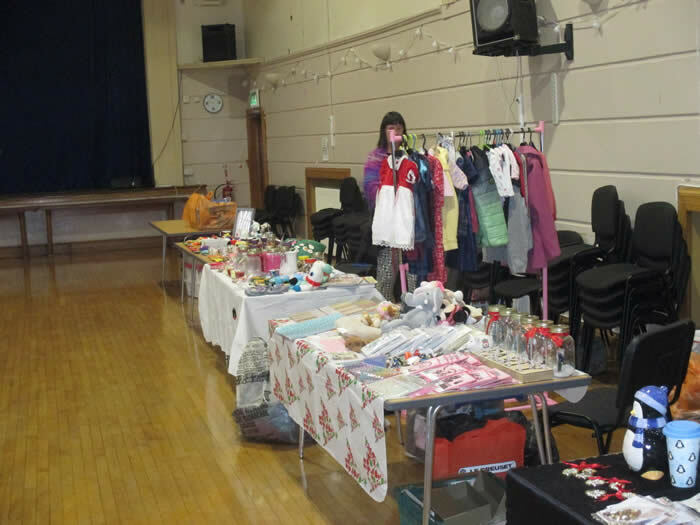 It was a lovely day and even better was the fact that £115.45 was raised for the Charity. Thank You to everyone who came to the stall and thanks to the Carnival Organisers for letting us take part. Lyn attended the Eucharist Service at St Mary's Church, Tenby on Wednesday 10th June during which the Charity were presented with a cheque for £500. 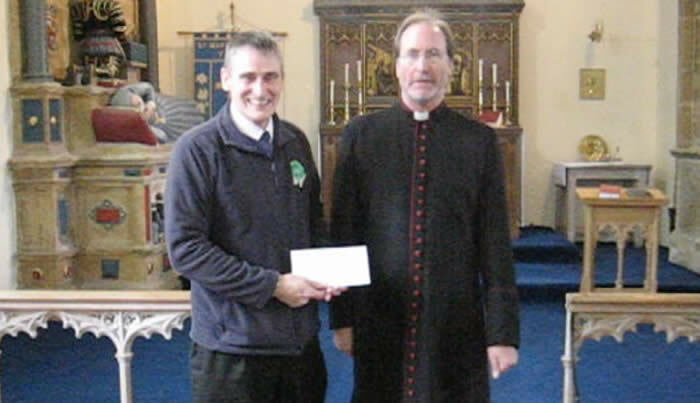 The cheque was presented by Canon Reverend Andrew Grace on behalf of the St Mary's Church Charity Fund. We are very grateful to receive this wonderful donation which will help to fund the Support Centre and Outreach Services. The Charity were honoured to be chosen as one of the "Nominated" Charities for this years Pembrokeshire Classic Car Club Annual Show at Scolton Manor on the 7th June. It was a fantastic day and Derryn (Support Worker) and her lovely family were manning our Charity stall. We want to thank Mr Peter Badham (Secretary) and all the organisers for allowing us to be beneficiaries of this wonderful event. We met people from all over Wales who had travelled to see the show. Thank You very much on behalf of all at Pembrokeshire Cancer Support. 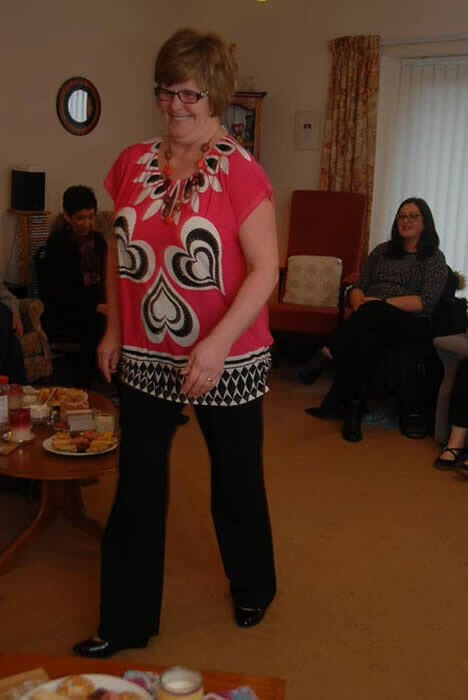 On Thursday 2nd April Barbara (Senior Support Worker) went along to the monthly meeting of the Wolfcastle W.I. 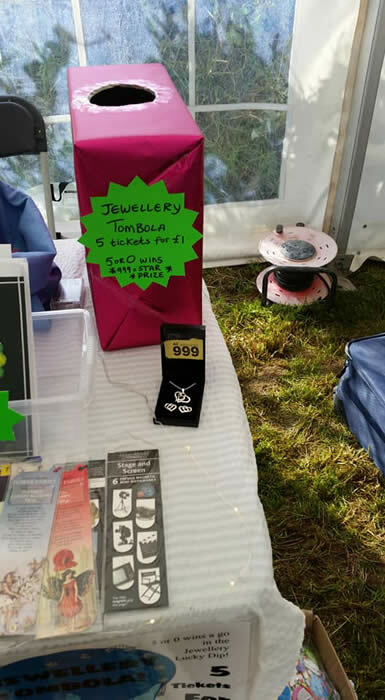 It was explained that they have a small fund from which they like to support local charities and this year Pembrokeshire Cancer Support was one of the chosen charities. 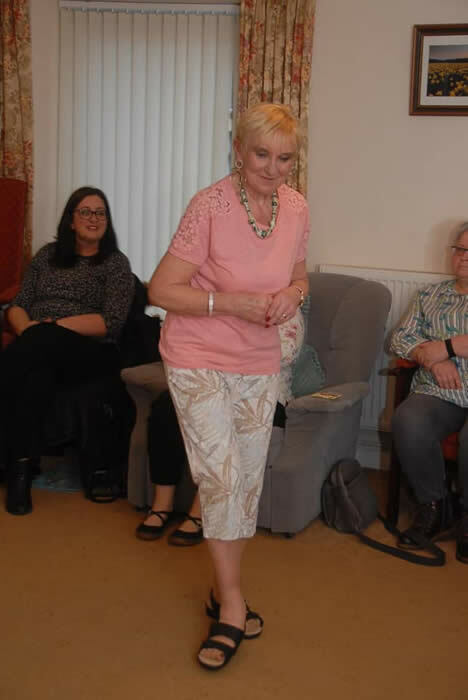 The photographs show Barbara receiving a cheque for £100 which will go towards helping with the many Home Visits that Barbara undertakes, some of which are in the Wolfscastle area. Thank you to all the ladies of the Wolfscastle W.I. "On Saturday the 10th January the Cleddau lodge of the R.A.O.B held their 28th annual senior citizens charity lunch at the Fishguard Bay Hotel. 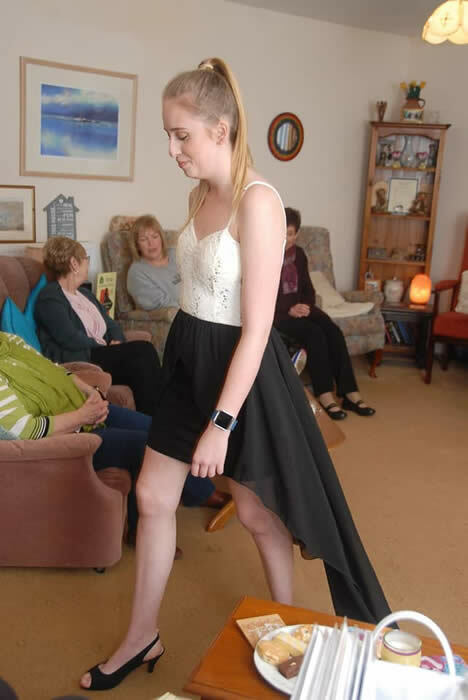 This Gala dinner was well attended by 160+ local people who enjoyed the hospitality of the Cleddau lodge, ensuring this successful year of fundraising ended with a bang. 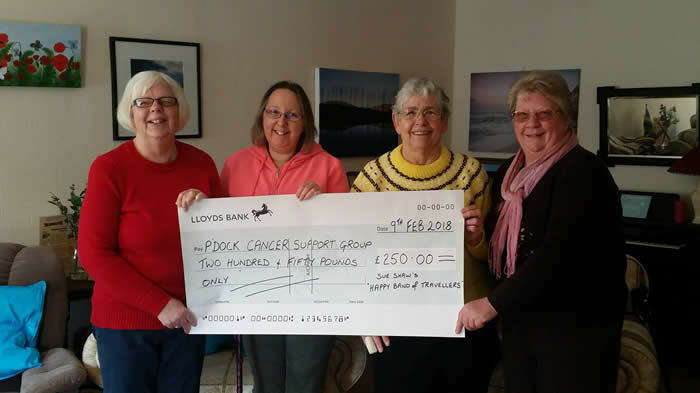 The main beneficiary of the fundraising this year was Pembrokeshire Cancer Support, who's Coordinator Lyn Neville and Lead Support Worker Barbara Miller can be seen here receiving the cheque for £6,000 for this worthy cause. 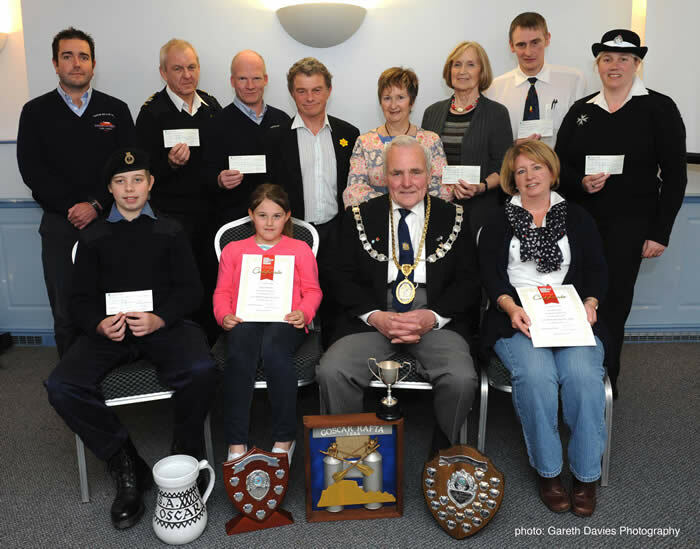 Other recipients of the Cleddau lodges fundraising this year are Paul Satori Foundation £1,000 and the Welsh Air Ambulance £1,000, and other smaller but significant donations include: Alzheimer's Association, Autistic Society, British Heart Foundation, The Royal British Legion,Diabetic Association and Letterston Memorial Hall. 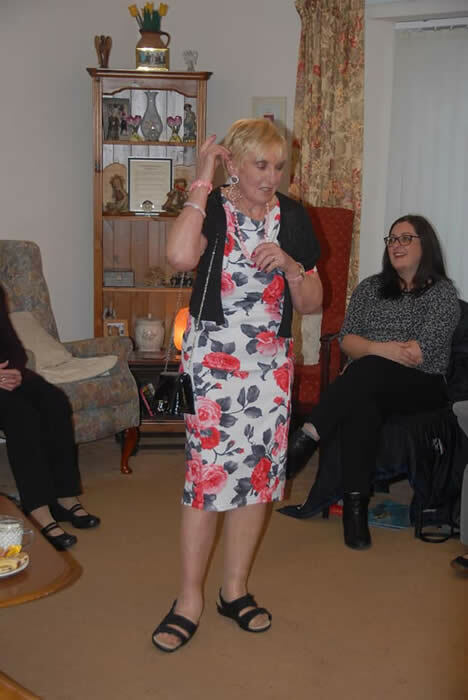 The Cleddau lodge would like to extend their thanks again to community members for continuing to support their fundraising efforts, which will continue this year with Breast Cancer Care Cymru being the main recipient of their benevolence." Lyn and Barbara were a little overwhelmed by the generosity of the RAOB as this is the biggest single donation the Charity has ever received. A Big Thank You is due to Matthew Webb, from Tenby, who took part in the Tenby Long Course Weekend in July. Matthew took part in the event and his friends did a bucket collection. Matthew is seen above handing over a cheque to Barbara (Support Worker) for a superb £578.58. Thanks Matthew for your help and support which is very much appreciated. Lyn attended the Eucharist Service at St Mary's Church, Tenby on Wednesday 28th May during which the Charity were presented with a cheque for £700. The cheque was donated by Canon Andrew Davies on behalf of the St Mary's Church Charity Fund. We are very grateful to receive this wonderful donation which will help to fund the Support Centre and Outreach Services. Each year Pembroke Power Station staff nominates a local charity to support. 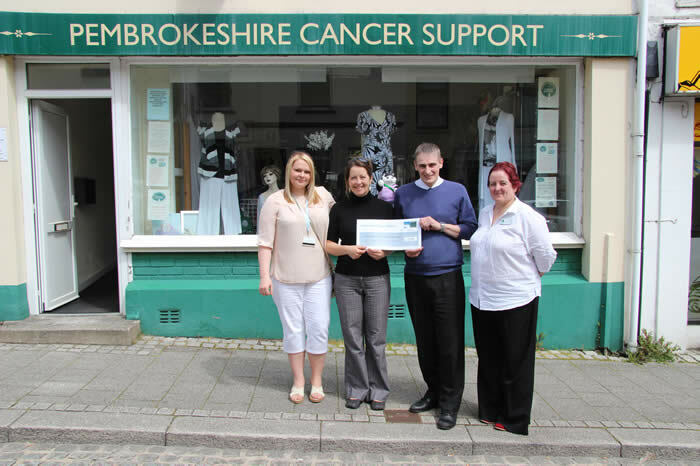 For the past year the stations chosen charity has been Pembrokeshire Cancer Support. 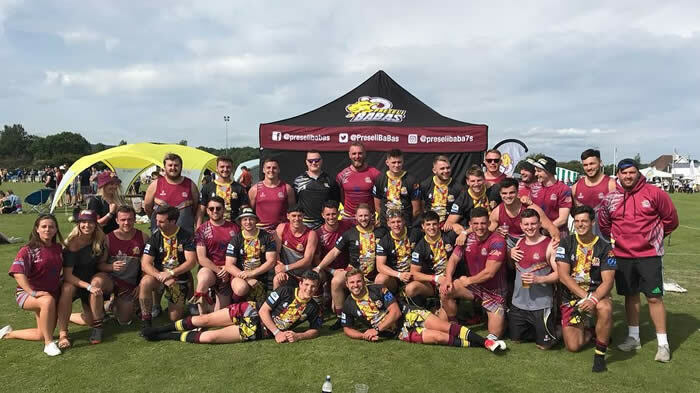 Teams from the site have been busy raising money through sponsored events, raffles, the weekly football club and a moustache removal. In addition to the fundraising efforts of staff at Pembroke Power Station, Pembrokeshire Cancer Support was given a powerful boost to mark a significant achievement at the power station. On 14 May the site reached 2000 starts; that is when a unit begins to generate (like starting a car). Pembroke is a Combined Cycle Gas Turbine (CCGT) power station and would have been expected to carry out just twelve starts per year. 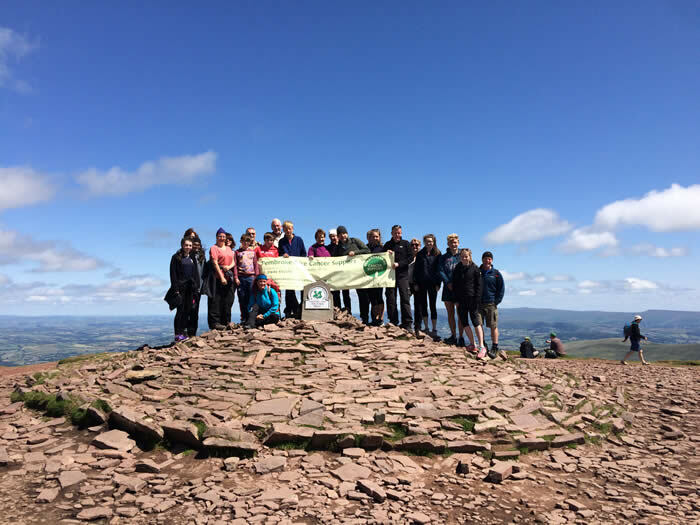 To celebrate this achievement, an extra £2000 was added to the money raised by staff for Pembrokeshire Cancer Support. Andrew Morgan, Pembroke Station Manager said,” This is a remarkable achievement for the site and this was a tremendous way for us to acknowledge the fantastic effort of all the staff in raising funds for this worthy cause during an extremely busy and challenging time,"
Pembrokeshire Cancer Support was pleased to receive the additional funds. They are about to roll out an outreach reflexology service and the donation will help to make sure those in need can receive support, therapy and guidance. Caption: Mair Lewis from Pembroke Power Station hands over the cheque to Pembrokeshire Cancer Support Manager Lyn Neville watched by Samantha Skone from the power station (left) and Derryn Bevan from the charity (right). Also pictured: Dave the Cat (PCS mascot and globe-trotter). Pembrokeshire Cancer Support, Wales Air Ambulance and Angle RNLI each received a donation of £1,000 from Royal SMIT Transformers BV who have recently completed a major project at Pembroke Power Station. "We are celebrating 100 years as a company and were the last to be granted Royal approval by the Queen of the Netherlands before her abdication," said Jos Doumen, Regional Manager of Royal SMIT Transformers BV. "We are very pleased to hear about the work being carried out by these volunteers in the local community and to be able to support these worthy causes." 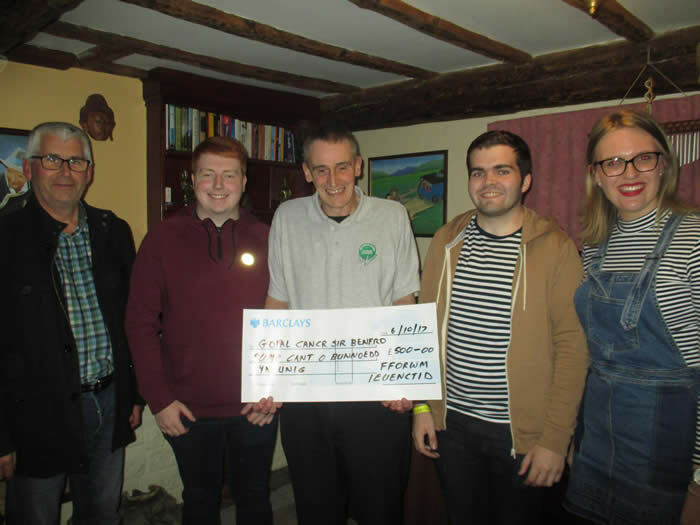 The charities were nominated for the donation by Pembroke Power Station as they have been the employees' chosen charities for the last three years. Production Manager Will Jeffery added that the site is very pleased with the success of project and happy that the local charities have benefited too. The photograph shows representatives from the three charities with members of the Pembroke Power Station team and Royal SMIT Transformers BV at the presentation at the site. Front row, from left: Lyn Neville and Barbara Miller from Pembrokeshire Cancer Support; John Allen-Mirehouse from Angle RNLI and Tony Key from Wales Air Ambulance. Back row, from left: Stefan van der Kolk, Project Manager, Royal SMIT Transformers BV; Will Jeffery, Production Manager, Pembroke Power Station; Chris Hodgson, MIET Director, Power System Partners Ltd; Nick Pritchard, EC&I Section Head, Pembroke Power Station; Daphne Bush, Pembroke Ladies Lifeboat Guild; Mair Lewis, Business Support, Pembroke Power Station and Jos Doumen, Regional Manager, Royal SMIT Transformers BV. Lyn Neville (Charity Coordinator) and Mrs Audrie Lewis (Treasurer) went along to Asda Pembroke Dock to a cheque presentation with Miss Sian Thompson (Community Colleague) and Asda Store Managers. The cheque for £2823.00 was from the sale of single use carrier bags. We are proud to have been chosen to receive this excellent donation which will certainly help with the Support Centre and Outreach Services. 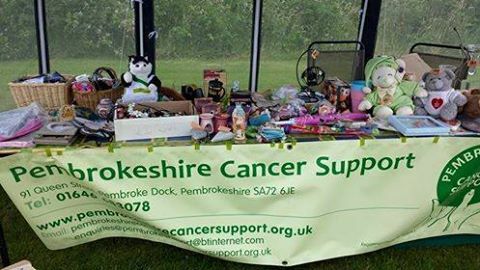 Anyone who wishes to support the work of Pembrokeshire Cancer Support can request a collection box. We are more than happy to deliver the box and pick it up again. Any Pubs, Clubs, Local Companies or individuals who would like to help are more than welcome to contact us on 01646 683078. Thank You. 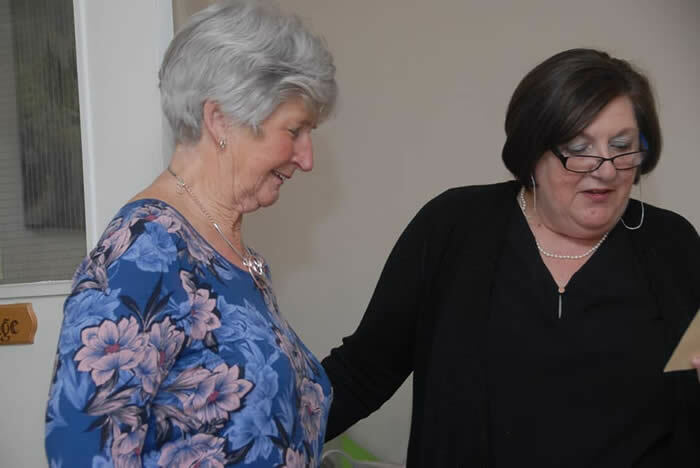 Barbara Miller (Senior Support Worker) went along to meet representatives of Tenby Ladies Circle (Jane - Sec, Kath - Chair, Sam - Vice Chair and Louise and Julia - Members) and Claire Webbs family (Neil - Husband, Matthew and David - Sons). A Santa Run was done in Tenby and the funds raised were in memory of Claire who was a much loved member of the Pembrokeshire Cancer Support Group. Claire was an inspiration to many of us at the Charity and is remembered fondly. 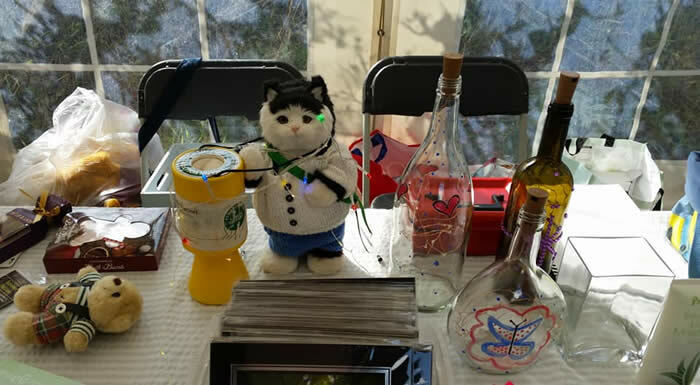 The total raised was a magnificent £2,500 which will make a huge difference to the Charity and help us to maintain our services at the Support Centre and Outreach Services. Barbara Miller (Senior Support Worker) went along to the Tiers Cross YFC to be presented with a cheque for £400 by Miss Non Thorne (Chairman). The Tiers Cross YFC Members worked hard over the festive period with lots of Carol Singing and raised this fantastic amount. Part of this sum raised will be used to train a staff member in basic Acupuncture to help with Pain and Stress Relief for the people who use our Cancer Support Centre and Outreach Services. Mr Neil Webb (Claire's Husband) and Roger and Mary Sheldon (Claire's Mum and Dad) came along to the Support Centre today to present a donation to the Charity in memory of Claire. The photograph shows Roger, Barbara Miller (Senior Support Worker), Mrs Audrie Lewis (Secretary / Treasurer), Neil and Mary. Claire was a very much loved member of our group and is missed by all who knew her. Claire was a friend and inspiration to many of us and was always willing to help and support the group. A donation totalling £1582 was given to the Charity and we are very grateful for the support of Claire's family who want the money to assist others who need help and support. Mrs Sue Shaw came to the Support Centre to present a cheque for £285 to the Charity. Sue can be seen presenting the cheque to Derryn Bevan (Support Worker). 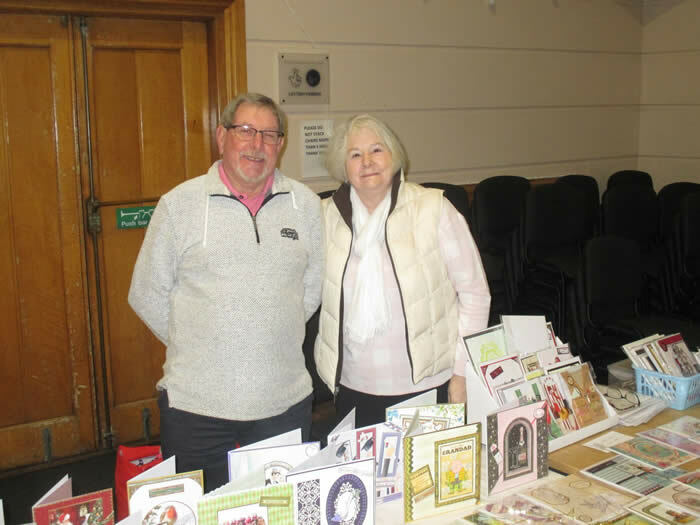 Sue and husband John organise day trips and holidays in the UK and Abroad for family and friends and raise money for charity on the trips by having Quizzes, Raffles, Lottery Bonus Ball Competitions etc. Sue's "Happy Band of Travellers" as they are known are people known to Sue and John through various organisations. The money raised this year was from 3 trips at home and abroad. If anyone is interested in joining the "Happy Band of Travellers" you can contact Sue on 01646 651989 and she will send details. We thank Sue and her Happy Band for thinking of us and we very much appreciate their support. The Night Shift Team at Tesco Stores in Pembroke Dock has been collecting items to help benefit a local Charity. 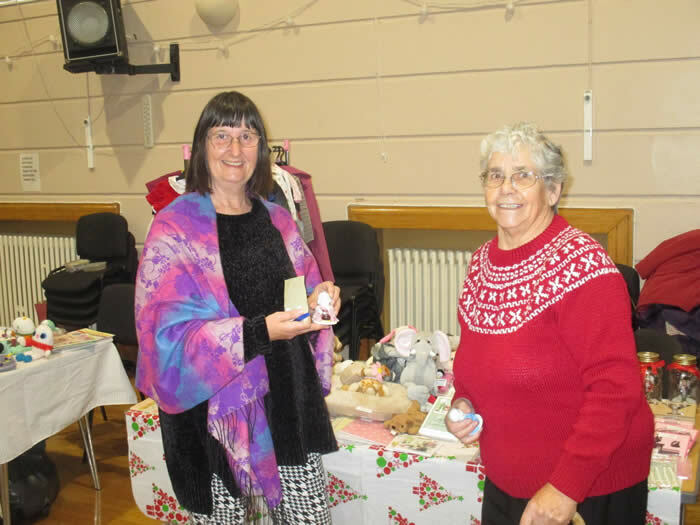 They especially wanted to donate to a local good cause which helps local people at this festive time of year. 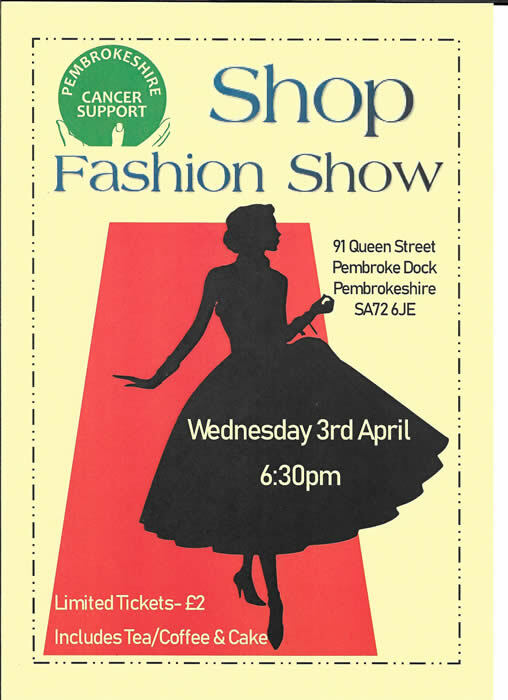 They chose to support Pembrokeshire Cancer Support who help Cancer sufferers and Carers throughout Pembrokeshire. Lyn Neville the Coordinator of the Charity went along to Tesco, Pembroke Dock at 7.45 in the morning – the end of the Night Shift - to be presented with two large boxes of items which can be used in Hampers, Raffles and other Fundraising activities for the Charity. Lyn said, “this is a fabulous donation which will greatly help a very small local charity. Thank you to all the Night Shift Staff for their Support and Generosity which is very much appreciated”. Pictured at the presentation are Jamie Davies (Night Shift Manager), Darren Rees (Deputy), Mike Jones (Night Shift Team), Lyn Neville (Charity Coordinator) and Ms Claire Fernquest (Store Manager). Thanks to Ruth Howell (Tesco Community Champion) for organising the presentation. 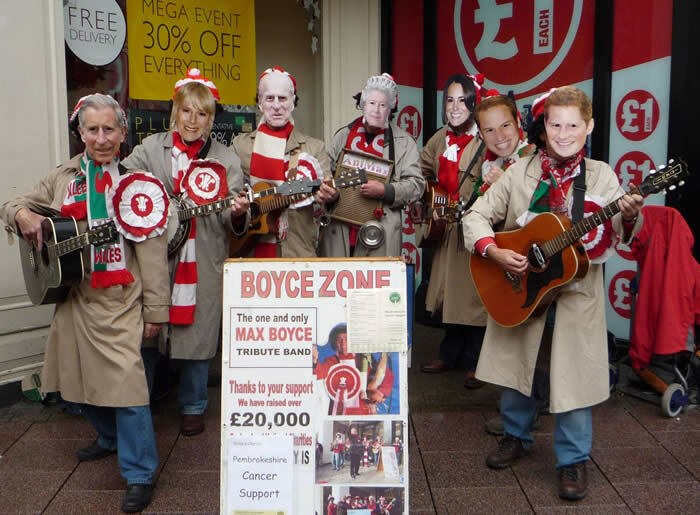 Pembrokeshire Cancer Support has to say a very big Thank You to Mr Hugh Griffiths and his partners in “Boycezone”, which is a Max Boyce Tribute Band (the bands hero!!). On Saturday 10th November the band busked around Cardiff on the day of the Wales v Argentina Rugby International. A superb total of £630 was raised to help the Charity. 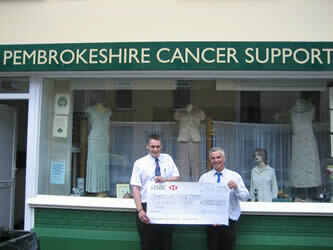 Hugh nominated Pembrokeshire Cancer Support to be the Charity of the Day, and we thank him for that. 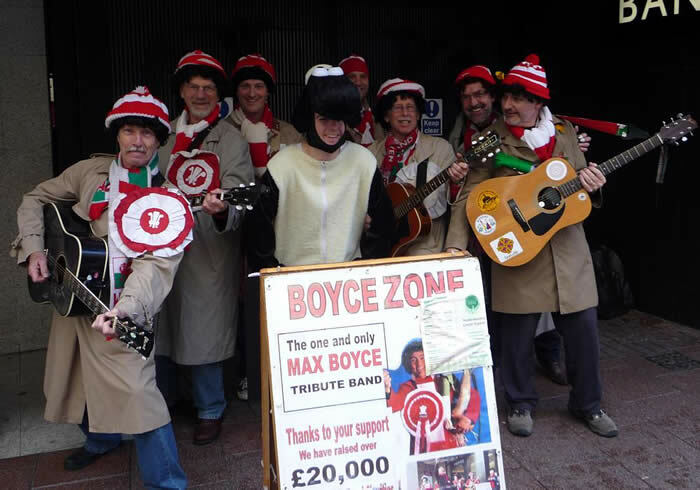 Boycezone have raised over £26,000 for good causes by busking at Rugby Internationals since their first in 1999. Hugh came to the Pembrokeshire Cancer Support Centre in Pembroke Dock to present the cheque to Charity Coordinator, Lyn Neville. Lyn said, “we are very grateful for the support of Hugh and Boycezone, and the generosity of the rugby fans on the day. 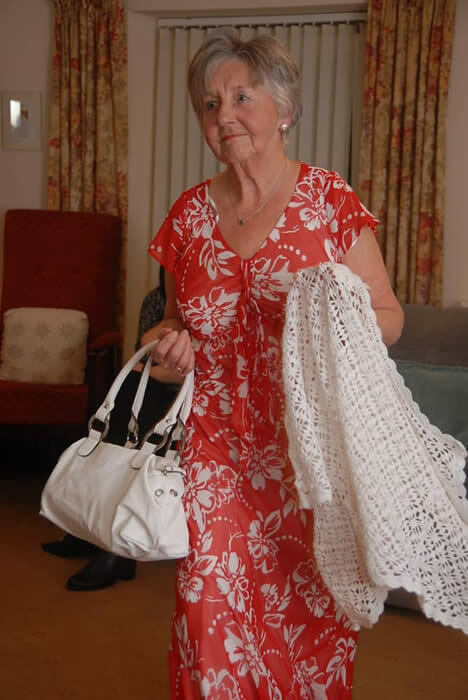 This will help greatly to enable us to keep supporting local Cancer sufferers and Carers”. Mrs Lin Elliott and Mrs Debbie Williams came to the Support Centre to present a cheque for £500 to our Senior Support Worker, Mrs Barbara Miller in memory of their Mum, Mrs Betty Williamson. The money was in lieu of flowers and we are very grateful to the girls for thinking about us. The donation is very much appreciated by all at Pembrokeshire Cancer Support and will help us to continue the work at our Support Centre. Lyn went along to Clerkenhill Adventure Farm and Frizbee Golf Course on Friday 31st August to collect a cheque from Mrs Dawn Lewis (Owner) and her daughter, Miss Heather Lewis. Clerkenhill Adventure Farm organised a "Charity Fun Night" on the 4th August to raise funds for us and the Young Life Charity. The Fun Night was excellent and was very well attended. We must thank everyone who supported the Fun Night and put a lot of hard work into making it such a successful evening. The cheque presented to Lyn was for £500 and will certainly help to maintain the services offered by the Charity. If you would like more information about Clerkenhill Adventure Farm please click on the photograph above which will take you directly to their website. 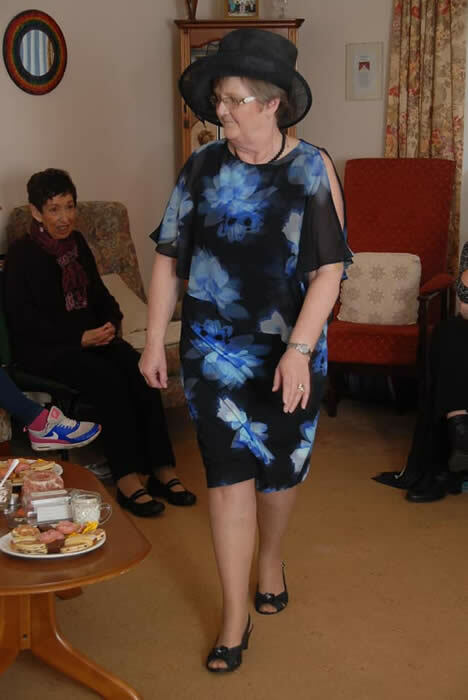 Lyn and Mrs Audrie Lewis (Secretary / Treasurer) attended the Bonny Challenge Cheque presentation on 19th June and were greeted by a team of 25 walkers and a hearty buffet lunch !! 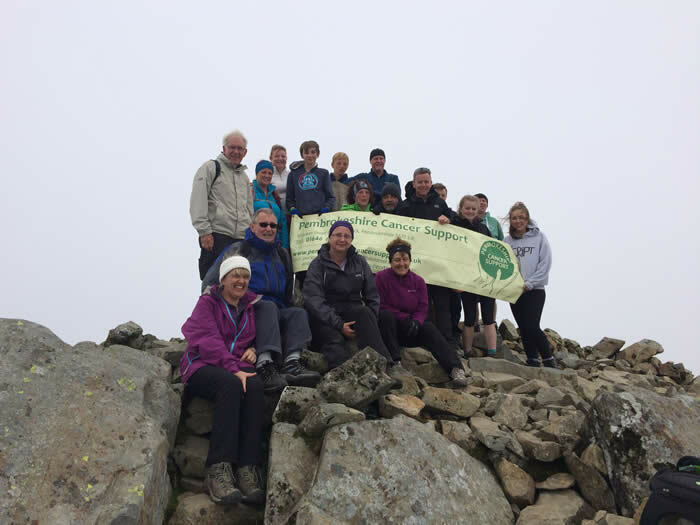 A whopping total of £4,827 was raised for the Charity as a result of a fundraising walk undertaken by Murco Petroleum employees earlier this year. The final total also includes £1,846 from Murco Refinery's match-funding scheme. With the aid of OMRON pedometers the employees collectively walked a massive 4757 miles, which is the equivalent distance that connects the Bonny Light Crude Oil Fields in Nigeria to the Milford Haven Refinery. At this specially arranged buffet the cheque was presented to the Charity. The picture above shows the presentation by Natalie Britton (Economics & Planning Manager), plus the organisers of the whole event, Helen Greenish and Michelle Noakes. We would like to thank all the employees of Murco who took part along with all who sponsored the walkers. Thanks also to Murco for the match funding. This extremely generous donation will make a huge difference and help us to maintain the services we provide. Finally thanks for a wonderful buffet which was so good we left with a doggy bag to take home !! 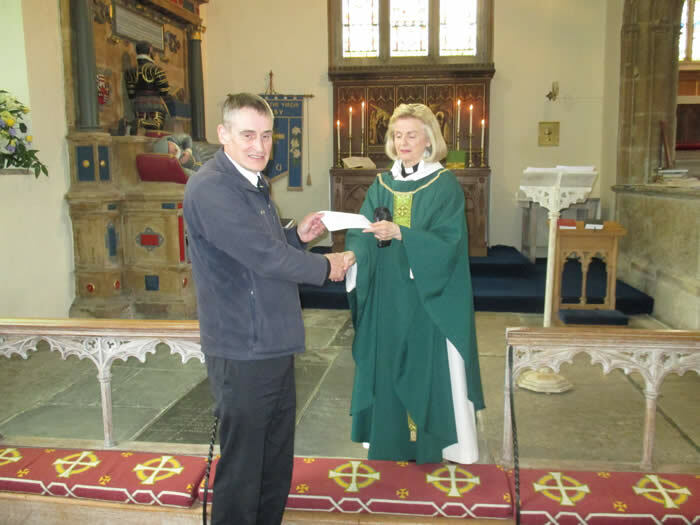 Lyn attended the Eucharist Service at St Mary's Church, Tenby on Wednesday 16th May during which the Charity were presented with a cheque for £700. The cheque was donated by the Reverend Andrew Davies on behalf of the St Mary's Church Charity Fund. Also awarded cheques on the day were representatives from the Salvation Army and Paul Sartori. We are very grateful to receive this wonderful donation which will help to fund the Support Centre and Outreach Services. Elvan Akkaya, Acting General Manager of South Hook LNG, highlighted the dedication of the group to the community of Pembrokeshire, “South Hook LNG is proud to support this dedicated charity, their team and volunteers offer an invaluable service to our county, aiding cancer patients and their families across Pembrokeshire”. 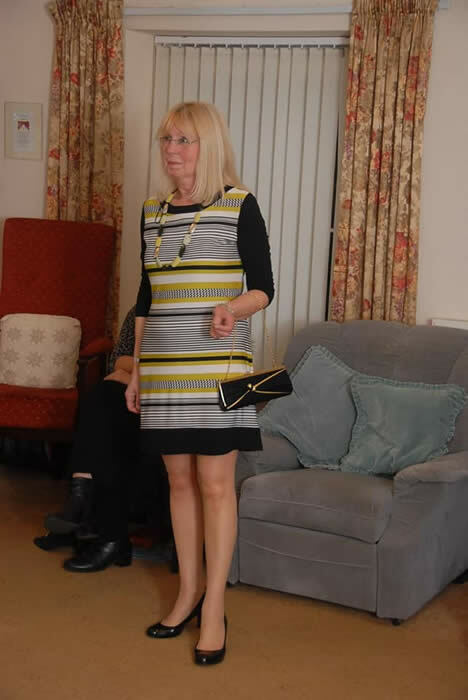 Lyn attended the Tenby Boxing Day Swim Presentation Evening at the Fourcroft Hotel, Tenby. We were one of the nominated charities at the event and received a cheque for £800 (we also received another £200 from a participant for a total of £1,000). 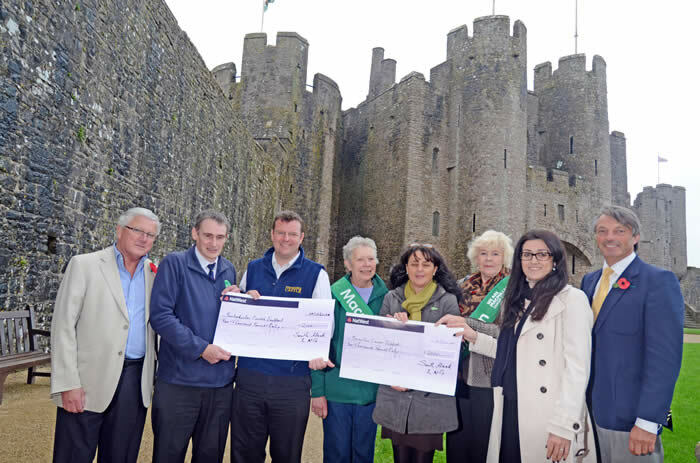 The photograph shows Lyn receiving the cheque from the Mayor of Tenby. Special thanks needs to go to Mrs Claire Webb and her family who took charge of the bucket collection for the charity on the day of the event. We are very pleased to receive this excellent donation which will help us to maintain services. 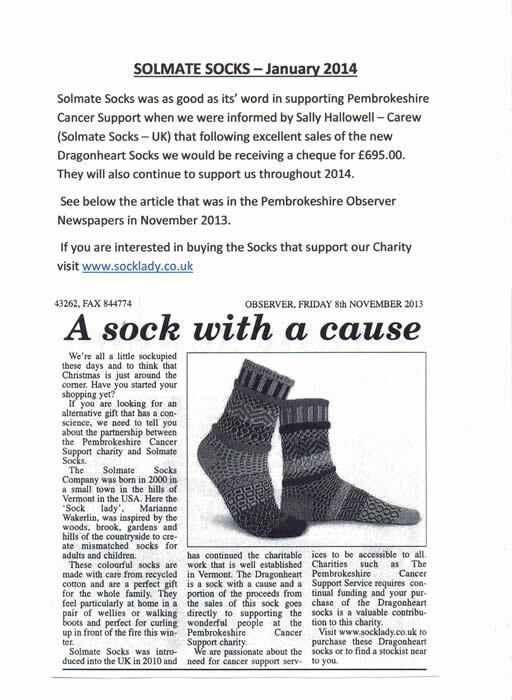 Pembrokeshire Cancer Support had an early Christmas present this week thanks to the Tenby Observer. Lyn, The Charity Coordinator, is seen receiving the cheque from Tenby Observer General Manager, Mr Andy Adamson (and yes it was a very windy day !!). This donation was following on from a Breast Cancer Awareness feature in the Observer papers. On Friday 25th November, following all their fundraising exploits, the Support Centre had a visit from Pam, Angela and Giulietta. On the 3rd November a Coffee Morning was held at the Royal Oak in Fishguard and was very well supported. The ladies raised a total of £1080 which was donated to our charity in memory of Pam's husband who sadly died in April. The ladies are pictured with Barbara (Support Worker). We are very grateful for this wonderful donation which will help with the services we offer throughout the County of Pembrokeshire. 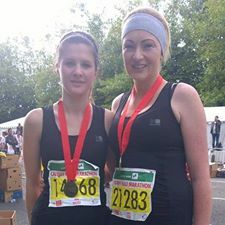 Ms Caroline Wheeler, who works locally for Bevan & Buckland, ran the Cardiff Half Marathon for us on the 16th October and raised an excellent £100. 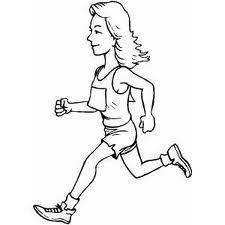 Caroline ran the distance in 2 hours and 30 minutes. Caroline had an eventful run and told us she would have completed in 2 hours and 10 minutes but had to help with First Aid to a lady who collapsed right in front of her!! Whatever time Caroline achieved we are very proud of her and thank her for her help and support which is very much appreciated. 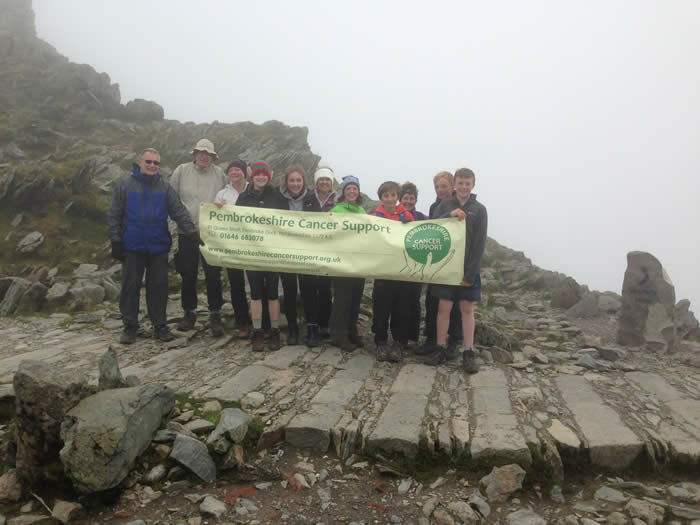 The fundraisers from the Pembroke group "Keep It Local" have certainly done just that with a donation of £2,000 to our charity. Much hard work and organisation has gone into raising this money. Jane Rogers, Jeanette Birch and Emma Hughes are no strangers to early morning Car Boot Sales, Bingo Competitions, Raffles and anything else that can raise money to help local people. 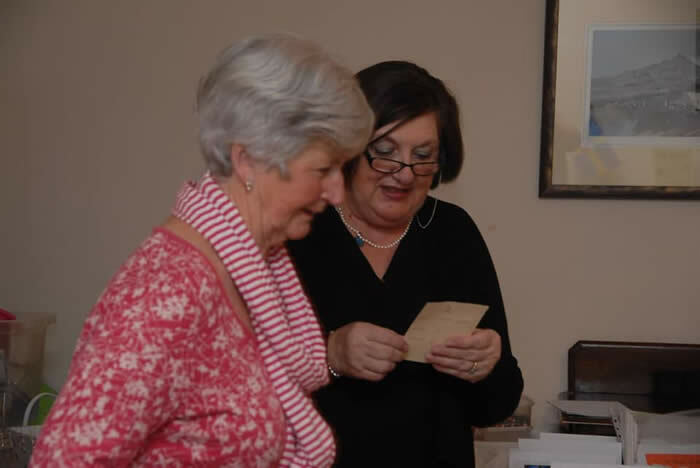 The photograph shows Lyn receiving the cheque from Jeanette Birch (Treasurer). We are very pleased to receive this very generous donation which will help us to maintain our services to local people with Cancer. Following the very successful (but a little damp !) 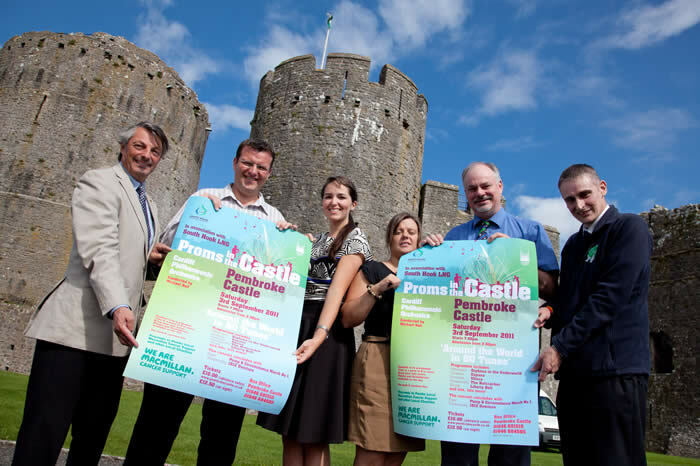 Proms in the Castle Event, held in association with South Hook LNG in September, the organisers were delighted to announce and present £2,000 each to the three charitable organisations involved, namely Pembrokeshire Cancer Support, Macmillan Cancer Support and the Pembroke Castle Charitable Trust. The event attracted a Proms audience of over 900 people, who braved the weather and helped raise many thousands of pounds for charity. Proms in the Castle went ahead on Saturday 3rd September and as you can see below turned out to be very wet !! This did not dampen the enthusiasm of the crowd who turned out for the event. 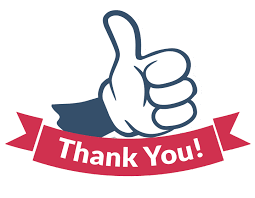 Special Thanks must go to South Hook LNG who sponsored the whole event, Phil Thompson (representing Macmillan) who organised the event and Jon Williams who runs the Castle. 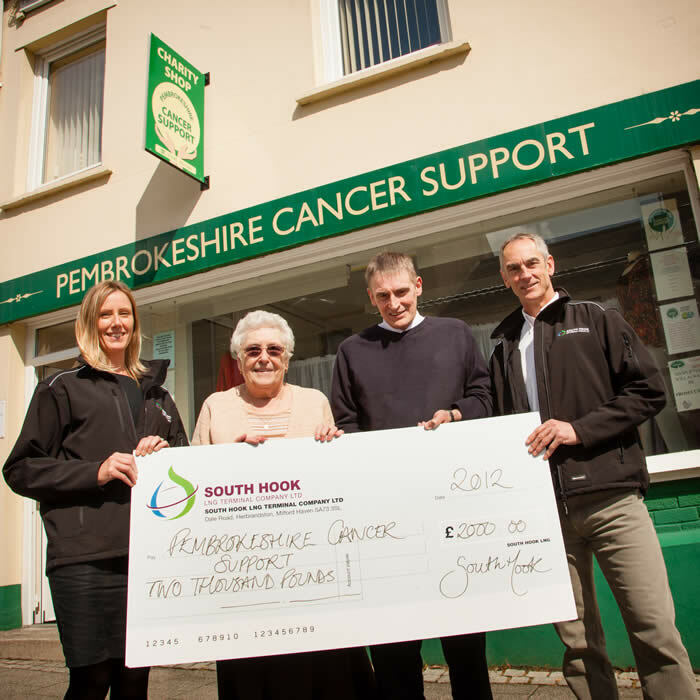 Pembrokeshire Cancer Support was the nominated charity of South Hook LNG. As you can see from the photograph above, all the meetings to arrange the event were held in bright sunshine !! The day of the event was very wet but the "British Spirit" kicked in and all who attended had a great time. One gazebo had a table with Champagne buckets and a candelabra !! The choirs who started the event, Tempus and Neyland Ladies were excellent. The Cardiff Philarmonic Orchestra gave a superb performance which was topped off by fireworks in time to the "1812 Overture". Everybody was flag waving and feeling very patriotic to "Land of Hope and Glory". On the day the Charity was represented by Lyn (Coordinator), Geraldine (Support Worker) and Kevin (very handy-man). Lyn gave an interview on the day to Radio Pembrokeshire, who must also be thanked for their total support of the event. DRAGON LNG, WATERSTON, MILFORD HAVEN. On Thursday 30th June, 2011, Mrs Audrie Lewis (Secretary / Treasurer) and Mr Dennis Thirkill (Committee) went along to the Dragon LNG Plant in Waterston to be presented with a cheque for £500 by Julia Norton (Community Support). This generous donation is to help support the cost of Relaxation Classes at the Charities Cancer Support Centre in Pembroke Dock. 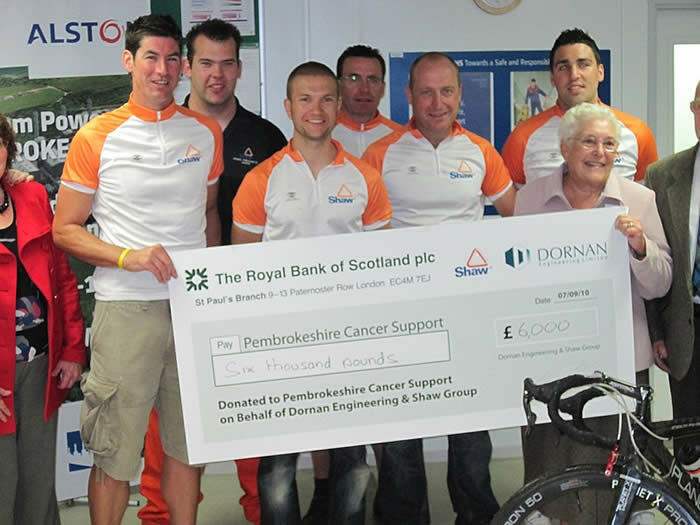 On the 8th September a group of cyclists set off from Derby to Pembroke to raise funds for Pembrokeshire Cancer Support. This Charity Cycle Ride was over 2 days and 240 miles of mainly A and B roads. This fine team was led by Paul Carvill who came up with the "crazy" idea. Paul works for the Shaw Group UK Ltd who are assisting with the building of the new Pembroke Power Station. The full team was Paul, Andy Veitch, Steve Clark, Rob Holland, Jamie Barlow and the very important support driver, John Richardson. Amazingly for us this Charity Cycle Ride was a huge success and raised the fantastic total of £6,000. This is the biggest donation the Charity has ever received and will make a major difference in moving forward with improvements and support. 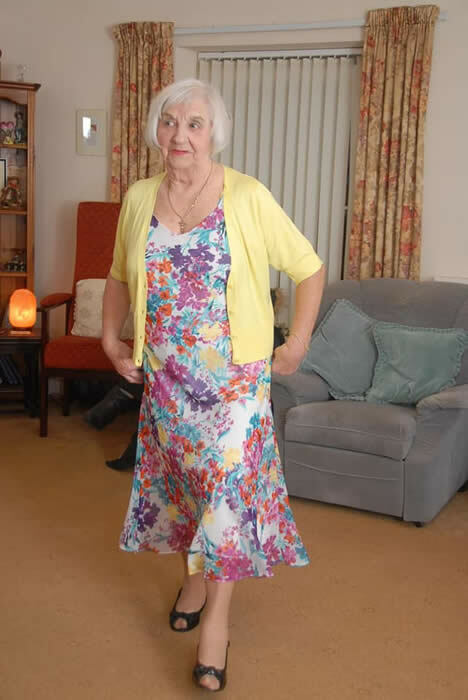 The first purchase will be a new stairlift for the Support Centre in Pembroke Dock which will allow people with mobility issues to gain access to the Centre. Thank You all so much for this incredible donation. SOUTH HOOK LNG On the 8th July, 2010 we were visited by representatives from South Hook LNG who make donations through their Community Liaison Team. We were again lucky enough to be given a substantial donation to enable us to continue to offer help and support to people affected by Cancer throughout Pembrokeshire. The cheque was presented by Mr Mohammed Al-Naimi who is the Director and General Manager at South Hook LNG. He was accompanied by Mr Hart (Business Planner), Ms Milne (Operations Admin) and Ms Allen-Clarke (Community Liaison Co-ordinator). Lyn and Geraldine from the Charity are seen happily accepting the cheque. 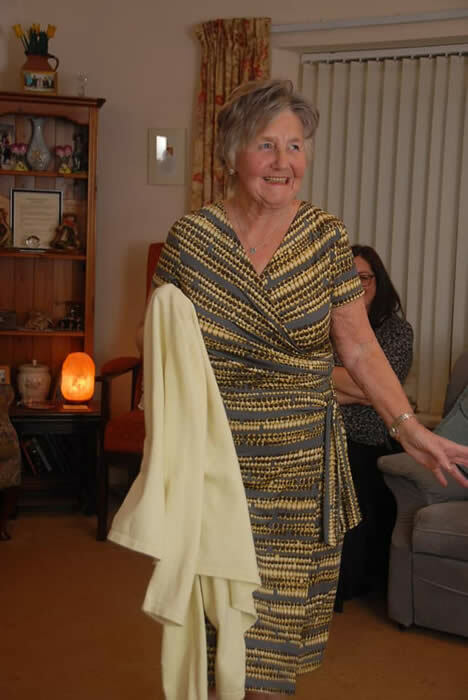 Local charity, Pembrokeshire Cancer Support, based in Queen Street, Pembroke Dock have recently received a donation of 100 door mats from The Turtle® Mat Company. Popular with home owners across the country for over 15 years, Turtle® Mats range from plain colours to beautiful designs from the National Trust, whilst the RHS collection has long been the gardener’s best friend, trapping dirt and soaking up wet. The Country Living and the William Morris collections celebrate British style adding colourful touches to homes everywhere. Lyn went along to the Murco Refinery in Milford Haven on Wednesday 3rd March, 2010 to collect a cheque for £1,920. The Charity made an application to the Sponsorship and Donations Committee at Murco, for help with the cost of Relaxation Classes at the Support Centre. At Murco's meeting in February they agreed to cover the costs for a whole year!! Lyn is seen collecting the cheque from Ms Susan Pugh and members of the Sponsorship and Donations Committee. The photograph does not lie, it was very cold !!. 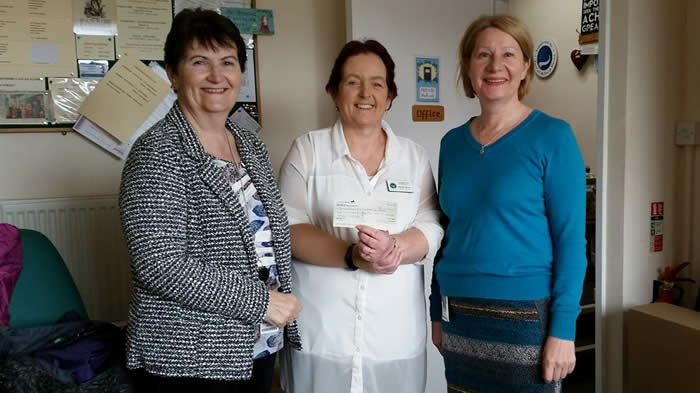 A very big Thank You is due to all at Murco for this excellent donation which will enable Cancer Sufferers to enjoy Relaxation Classes for the next 12 months. 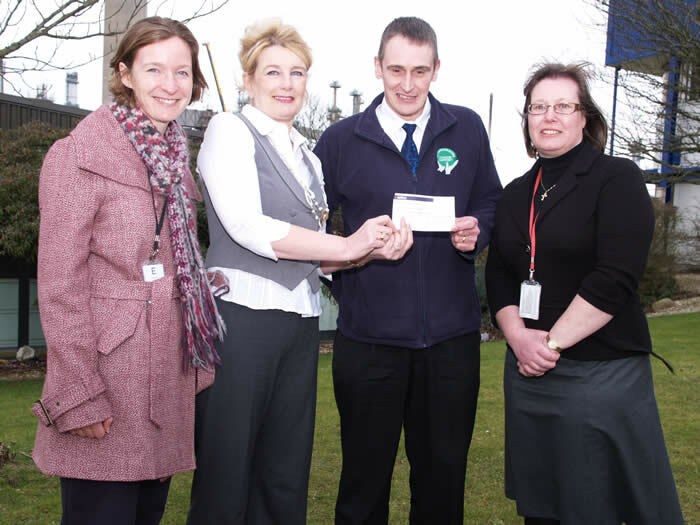 Lyn went to the Milford Haven Cogen Plant on Friday 26th February, 2010 to collect a cheque for £1,000. The Plant has a donations committee which has a representative from all the companies on site like AMEC Power & Process, Milford Energy, Kitsons Group, Dawnus Construction, J.W & E Morris & Sons Ltd etc. The "Cracked It" scheme is an employee lead initiative that provides a donation to a local charity or good cause on achievement of HSE performance goals over a set period of time. The set period of time in this case is 28 days. Anyone working on the project is able to nominate a local charity through their company representatives. Keith Aspinall of Dawnus Construction nominated our charity. Lyn was lucky enough to meet some of the workers who donate to the scheme and say a personal Thank You. A very big Thank You to all the workers on site who have donated to this wonderful donation. 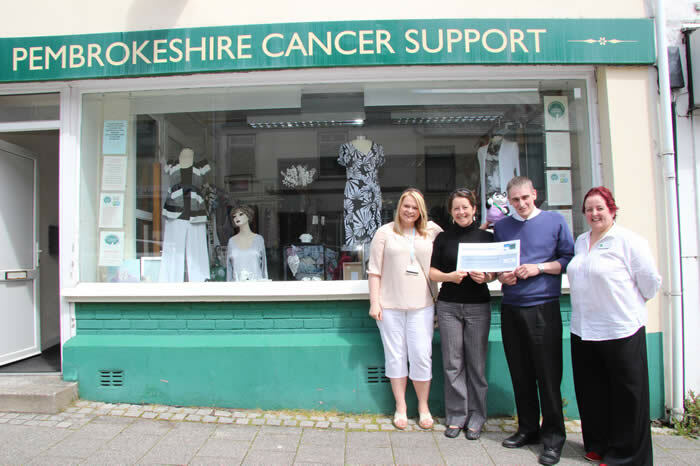 The local ladies from Herbalife have very generously donated £200 to Pembrokeshire Cancer Support through their fundraising efforts. Lyn attended a presentation on Tuesday 22nd December, 2009 at the Brewery Inn, Cosheston. Herbalife are at the forefront of nutritional and weight management and more information on Herbalife can be found by following the link on our Links Page. A big Thank You to all the Ladies from Herbalife, your support and generosity is very much appreciated. The Tesco Charity Trust have very generously donated £1,000 to the Support Centre for us to make improvements to our successful Card Making group and to provide Entertainment products for us to hold Whist Drives etc. Ruth Howell, who is the Tesco Community Champion for the Pembroke Dock Superstore, came to present the cheque on the 14th September, 2009. Ruth has been a great support to the Charity and helps in lots of other ways - Thanks Ruth !! South Hook LNG very kindly helped us with the cost of Reflexology for a whole year. 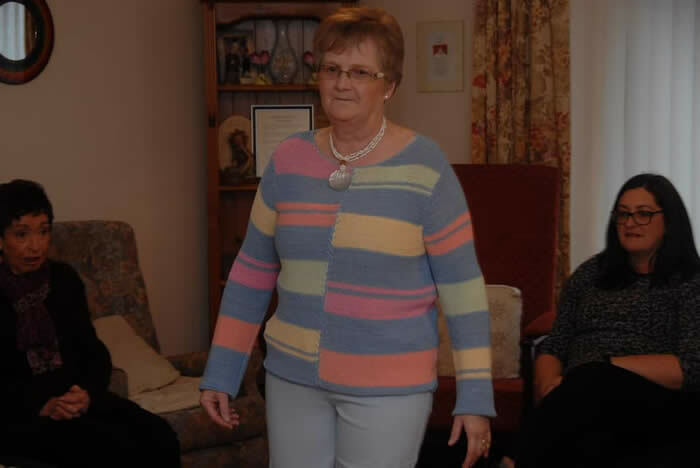 Ruth Howell , Tesco Community Champion - We are very grateful for all the Help and Support given to us by Ruth who works for Tesco, Pembroke Dock and is the "Tesco Community Champion". She is a true Ambassador for Tesco and gives her time to helping lots of local Charities and Organisations. She has been invaluable in helping us to raise much needed funds. Thank You Ruth from all of us at Pembrokeshire Cancer Support.